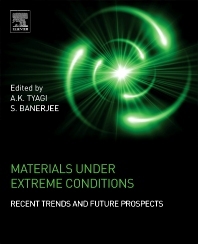 Materials Under Extreme Conditions: Recent Trends and Future Prospects analyzes the chemical transformation and decomposition of materials exposed to extreme conditions, such as high temperature, high pressure, hostile chemical environments, high radiation fields, high vacuum, high magnetic and electric fields, wear and abrasion related to chemical bonding, special crystallographic features, and microstructures. The materials covered in this work encompass oxides, non-oxides, alloys and intermetallics, glasses, and carbon-based materials. The book is written for researchers in academia and industry, and technologists in chemical engineering, materials chemistry, chemistry, and condensed matter physics. Dr. A.K. Tyagi joined Bhabha Atomic Research Centre (BARC), Mumbai, in 1986 through BARC-Training School. Since then he has been working in the field of chemistry of nanomaterials, functional materials, and nuclear materials. He was a Max-Planck Fellow at MPI, Stuttgart, Germany, during 1995-96. Presently he is Head, Solid State Chemistry Section, Chemistry Division, Bhabha Atomic Research Centre (BARC), Mumbai, and also a Professor of Chemistry at Homi Bhabha National Institute (HBNI). He has published more than 450 papers in international journals, two books, twelve book chapters, and one patent. In recognition of his work, he has been conferred with several prestigious awards, including the Homi Bhabha Science & Technology Award, the Gold Medal of Indian Nuclear Society, the MRSI Medal, the CRSI Medal, the Dr. Laxmi Award by ISCAS, the Rheometric Scientific-ITAS Award, the IANCAS-Dr.Tarun Datta Memorial Award, the RD Desai Memorial Award of ICS, the Rajib Goyal Prize in Chemical Sciences, the DAE-SRC Outstanding Researcher Award, the CRSI-Prof. CNR Rao National Prize for Chemical Sciences, and the ISCB Award for Excellence in Chemical Sciences. He is a Fellow of the Royal Society of Chemistry, UK (FRSC), the National Academy of Sciences, India (FNASc), the Indian Academy of Sciences (FASc), and Maharashtra Academy of Sciences (FMASc). He has been a visiting scientist to several countries, including Germany, USA, Canada, France, Spain, Sweden, Portugal, Russia, Japan, Israel, China, Singapore, Malaysia, and Australia. Dr. Srikumar Banerjee is presently DAE Homi Bhabha Chair Professor at Bhabha Atomic Research Centre (BARC), Mumbai, India. He completed his BTech inMetallurgical Engineering from Indian Institute of Technology, Kharagpur, in 1967. He joined the Metallurgy Division, Bhabha Atomic Research Centre (BARC), Mumbai, in 1968 after graduating from 11th batch of BARC training School. He obtained his PhD in 1974 from IIT, Kharagpur. He has occupied several important positions such as Head, Metallurgy Division, BARC, Director, Materials Group, BARC, and Director, BARC, and subsequently became Chairman, Atomic Energy Commission, India, in 2009, and superannuated in April 2012. He has done pioneering work in the field of martensitic transformations, rapid solidification, omega transformation, quasi-crystalline solids, and shape memory alloys. He has been a senior visiting Fellow at the University of Sussex, UK, Humboldt Foundation Fellow at Max-Planck Institute for Metallforschung, Stuttgart, Germany, and a visiting Professor at Ohio State University, Columbus, USA. In recognition of his seminal contribution to the field of Materials Science, Dr. Banerjee has been conferred with numerous national and international prestigious awards, including INSA Young Scientist Award (1976), National Metallurgists' Day Award (1981), Acta Metallurgica Outstanding paper Award (1984), Shanti Swaroop Bhatnagar Prize in Engineering Sciences from Council of Scientific and Industrial Research (1989); GD Birla Gold Medal of The Indian Institute of Metals (1997), INSA Prize for Materials Science, MRSI - Superconductivity and Material Science Prize (2003); Indian Nuclear Society Award (2003), Alexander von Humboldt Research Award (2004), Prof. Brahm Prakash Memorial Medal (2004) from INSA, Padma Shri from Government of India (2005), Distinguished Materials Scientist Award from MRSI (2008), Indian Science Congress Association’s Excellence in Science and Technology Award (2009), Ram Mohun Puraskar of Rammohun Mission for outstanding contribution to Nuclear Science (2010), CNR Rao Prize Lecture in Advanced Materials (2011), and M. N. Saha Birth Centenary Award (2012) from Indian Science Association Congress. He has been conferred with several Doctor of Science (Honoris Causa) degrees from various universities and institutions, including Sathyabama University, Chennai; Bengal Engineering and Science University, Shibpur; Indian Institute of Technology, Kharagpur; Guru Ghasidas University, Chattisgarh, and University of Calcutta. He is an elected Fellow of Indian Academy of Sciences, National Academy of Sciences, India, Indian National Science Academy, Indian National Academy of Engineering, and Third World Academy of Sciences.